Nature’s Granite is a family owned and operated granite and quartz indoor slab selection center and stone fabrication business employing some of the finest stone artisans. 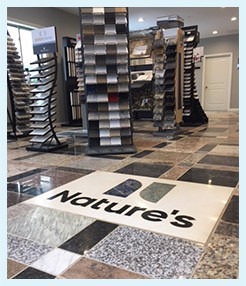 At Nature’s Granite our eyes are open to capture your imagination, from the detail of an artistic creation, to a custom designed pattern. The Nature’s Granite staff is proud to share your vision- from the time you walk in the door, call or email, through accomplishing your vision. Whether your project requires a kitchen counter top, fireplace surround, table top, bar top, vanity top, desk or conference table or another custom design, our skilled sales, scheduling and customer relationship departments will offer a turnkey approach satisfying your stone dream and meeting your scheduling deadlines.